Under the ground, deep in the earth, among the roots of the trees, the little root-children were fast asleep all winter long. So begins the lyrical, magical story of nature that delights us as a read-aloud every spring and fall. The Story of the Root Children is a celebration of the seasons through a fairytale about Mother Earth and the enchanted flower creatures she dresses in beautiful colors for their half-year above ground. It is a more innocent Persephone and Demeter, Gaia adorned in her most festive clothes. There are snow-drops, forget-me-nots, buttercups and poppies—each meadow flower choosing a bit of cloth for a summer dress. Beetles, ladybirds, butterflies and snails appear right on time as the trees green and the air softens. The story is gentle, poetic, many-layered and spiced with grumbling insects, industrious ants and a chill autumn wind. I discovered this tiny treasure when I was collecting a library for a very small child and we have enjoyed it ever since. The story appeals to our pagan, pantheistic sensibilities but it is a charming secular tale that doesn’t refute science or deify anything—and it can help to demystify death and loss as well as explain the life cycles of a year. 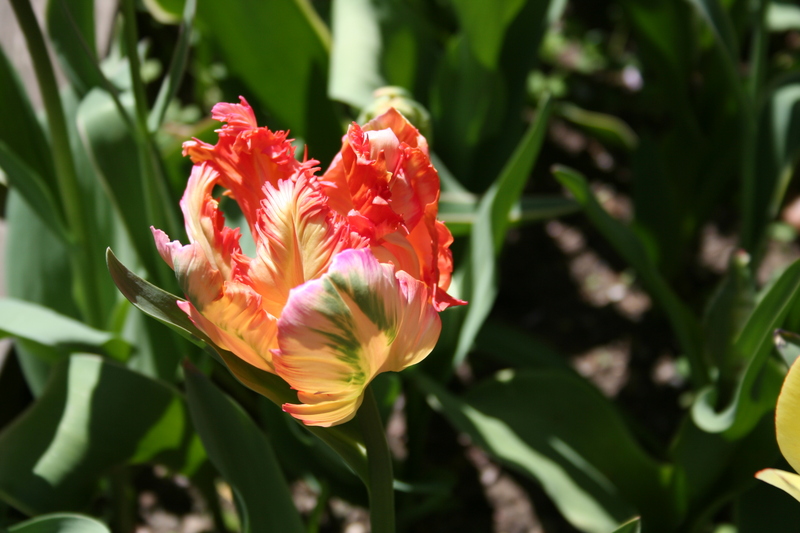 Another seasonal marker in our New York City neighborhood is the tulip festival in our community garden. 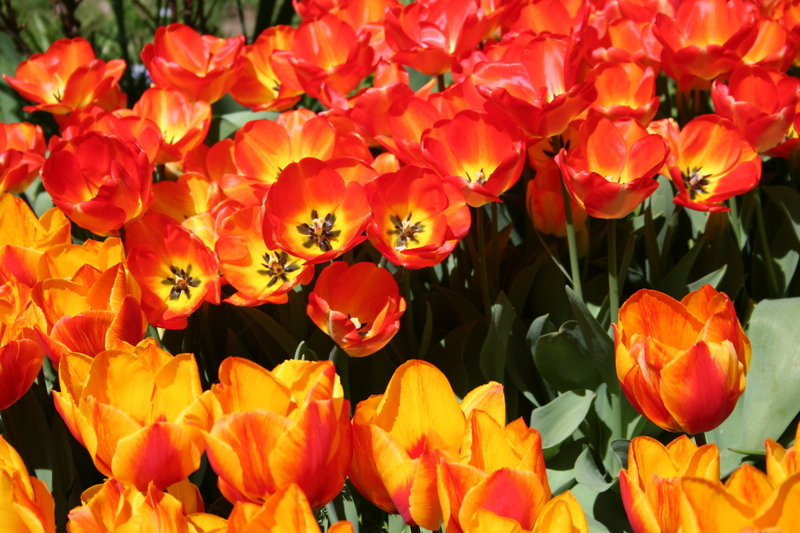 Every April the wonderful garden on West 90th Street erupts in a kaleidoscope of vivid blooms that are breathtaking for an instant and then gone for another year. The garden is in its glory right now and too seductive to ignore. 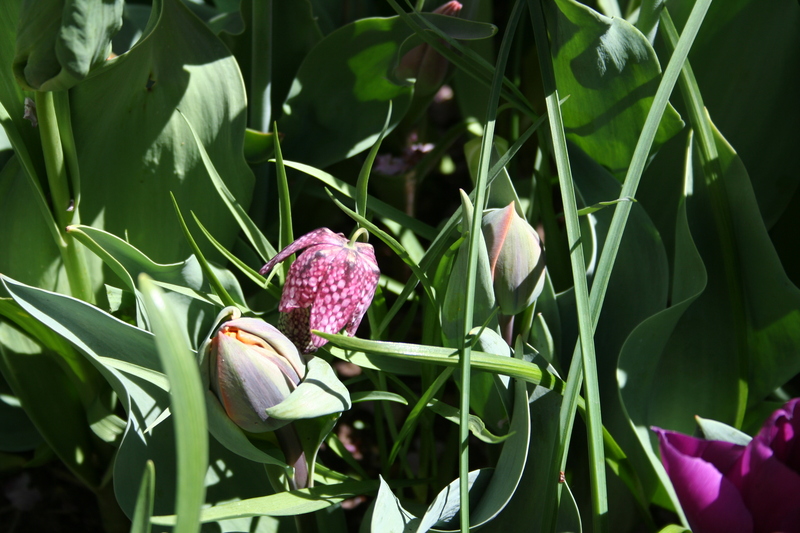 Tulips are showier blooms than the field flowers of The Root Children but they provide equivalent spellbinding magic. The book and the garden are balm for the spirit after the rigors of an unforgiving winter. Sometimes it helps to be reminded of the inexorable rhythm of the days and months, measured in the fragile petals of fairies and flowers. The Flint Heart is a fairy tale adapted from the work of Eden Phillpotts, a prolific writer who lived from 1862 to 1960 and told stories set in his beloved Devon county moors. Katherine Paterson, Newbery and National Book Award-winning writer, and her husband John, base this book-length tale on Phillpotts’ style as well as his imaginary worlds. It is a large, heavy, beautiful book with an amazing amount of white space, thick coated pages, and gorgeous illustrations by John Rocco who worked at Dreamworks on Shrek and at Walt Disney Imagineering and drew the art for the Percy Jackson and the Olympians series. At first, the language seems very simple and the story very broadly drawn, as if it is carefully rendered for unsophisticated readers. But first impressions can be misleading and this one is. The Patersons have filled the pages with charming characters, captivating names—like Jacky Toads, a Zagabog and a Snick, a pixie who reads dictionaries and a philosopher fairy king who dispenses judgment based on Point of View. Small children will love the illustrations and the story. Older children—no limits on age–will love the clever wordplay and humor. In The Flint Heart, the region of Dartmoor is plagued from prehistory by a dark magic encapsulated in a rock chip strung on a leather cord. Place it around your neck, or even in your pocket, and all the light and warmth and kindness goes right out of you, to be replaced by homicidal, self-centered, authoritarian, barbaric behavior that makes a shambles of your community and cannot be resisted. Shades of Tolkien and that cursed ring, although Tolkien’s ring was written after Phillpott’s work. How a couple of brave and imaginative children, a badly injured German hot-water bottle named Bismark and the helpful fairies, pixies and forest creatures defeat the flint heart is the central quest of the book but the digressions are as entertaining as the story. Read it and learn why the tortoise really won the race and what actually frightened Little Miss Muffet. Multiply naughts to discover why you can’t be marked off for them on an exam. Enjoy the interesting vocabulary and a tale told in nineteenth-century language smoothed out to make perfect sense to a twenty-first-century child. The Flint Heart is fun and it doesn’t dumb anything down for children. That alone is worth the book—no least-common-denominator, one-syllable-from-an-approved-list-of-age-appropriate-vocabulary words, as suitable for a chimp as a child, in this adventure. (Deep apologies to primates.) There is a moral to this story but it doesn’t get in the way. And the human, beast, hot-water bottle and fairy/pixie worlds live more or less happily-ever-after once the heart meets its ultimate fate—with a surprise twist. No spoilers. Grab a willing kid and The Flint Heart and settle in to find out for yourself.